You can purchase Quickflash products through selected distributors and specialty retailers located throughout the United States and Canada. 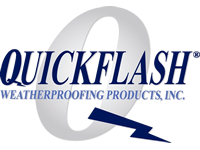 To locate your nearest reseller, please contact the Quickflash Weatherproofing Products Group's National Sales Office at 1-800-963-6886, e-mail us at QFInfo@QuickflashProducts.com, or select your state from the list below. Please e-mail us if you wish to be added or removed from our website.